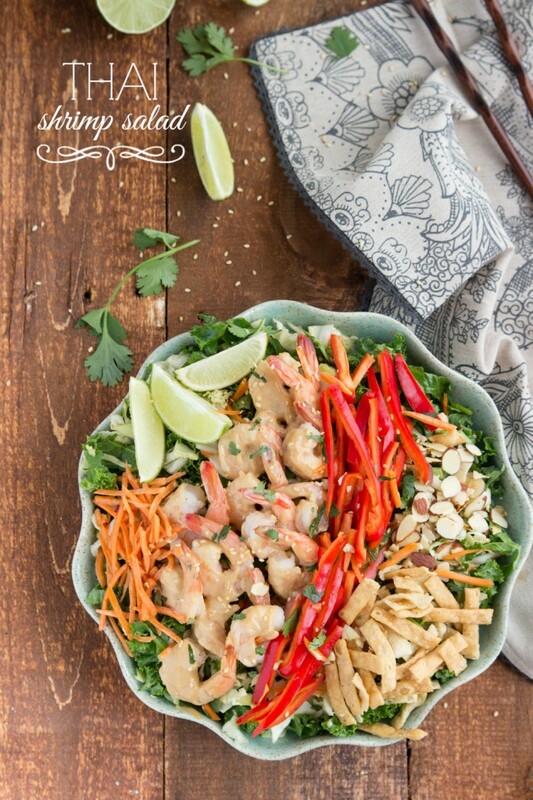 An Applebee’s copy-cat salad with an Asian salad blend, sliced almonds (or peanuts), peanut sauce shrimp, wonton strips, fresh cilantro, red bell pepper strips, and a chili lime vinaigrette. 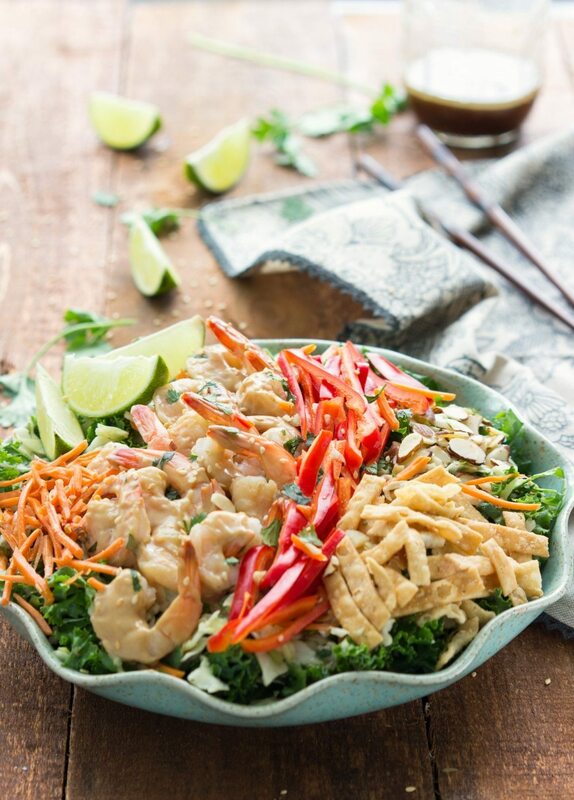 Remember that peanut sauce stir fry the other day? Well, I promised I would be back. With a copy-cat Applebee’s salad. Quick re-cap: The husband took me to Applebee’s and I went out on a limb, tried this salad, and LOVED it. So naturally I had to re-create it. And eat it non-stop for the past two weeks. In the name of recipe experimentation of course. Although, this salad is not exactly the same as the Applebee’s one, because, well I love changing things up. But he’ll never complain about anything I make. Except if there are onions. Okay and the shrimp? Guess what, I’m totally not a huge shrimp fan. Like, not a huge seafood fan at all. I know, I know craziness. But having a food blog means trying new things and new flavors. And I have to admit, I’ve found lots of new foods and flavors that I love since I’ve been blogging. However, shrimp is still not my favorite, and probably never will be. BUT the good news is, that means I tried this salad two ways. Shrimp, because I promised to try new things. And I tried it with some cooked chicken, which I loved. 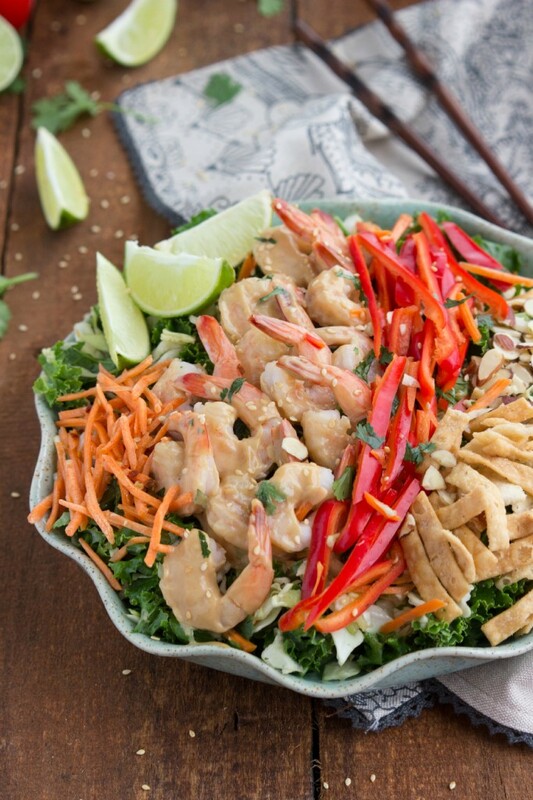 You can do either the shrimp or chicken in this salad. The peanut sauce gets brushed over which ever one you choose and is d.i.v.i.n.e. Also, I tried two different kinds of nuts – sliced almonds and smoked peanuts. I have to say, the almonds won in my book, but chose whichever you like best, because both were really good and a great complement to the other ingredients. And finally, I think we just have the dressing to talk about. I created a chili lime vinaigrette for this salad. It’s an easy, throw-the-ingredients-together, and shake kind of recipe. However, a pre-made dressing can definitely be used if you are in a pinch for time. I added a note to the dressing that crushed red pepper flakes can be added. This is for people that like it HOT. The husband, not so much. Me? Bring it on. If a meal is hot enough to make me cry, it’s gooo-ood. And there you have it – an awesome salad thanks to some Applebee’s inspiration! Preheat the oven to 400 degrees F. Line a large baking tray with parchment paper. Rinse the shrimp under cold water for a minute and then toss in olive oil and with salt and pepper. Spread evenly on the tray and bake for about 5 minutes or until just pink, firmed, and cooked through. Remove from the oven and set aside. Remove the packaging for the Asian chopped salad and pour into a large bowl. Thoroughly wash and scrub the kale. Chop into very small pieces and toss with the chopped salad. 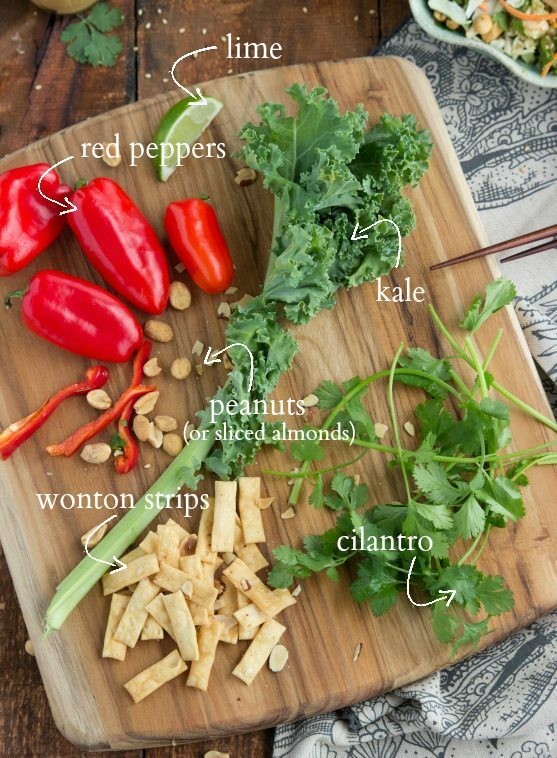 Add in the red pepper (remove seeds and slice thinly), shredded carrots, and almonds or peanuts. Combine all of the ingredients in a sealable jar. Seal the jar tightly and shake until combined. Adjust seasonings to preference and then pour over the salad and toss to combine. Combine all of the ingredients in a blender or food processor. Blend until smooth, taste, adjust seasonings to preference, and brush or toss the shrimp in the sauce. Add the shrimp to the salad. Add in additional cilantro and seasame seeds if desired. 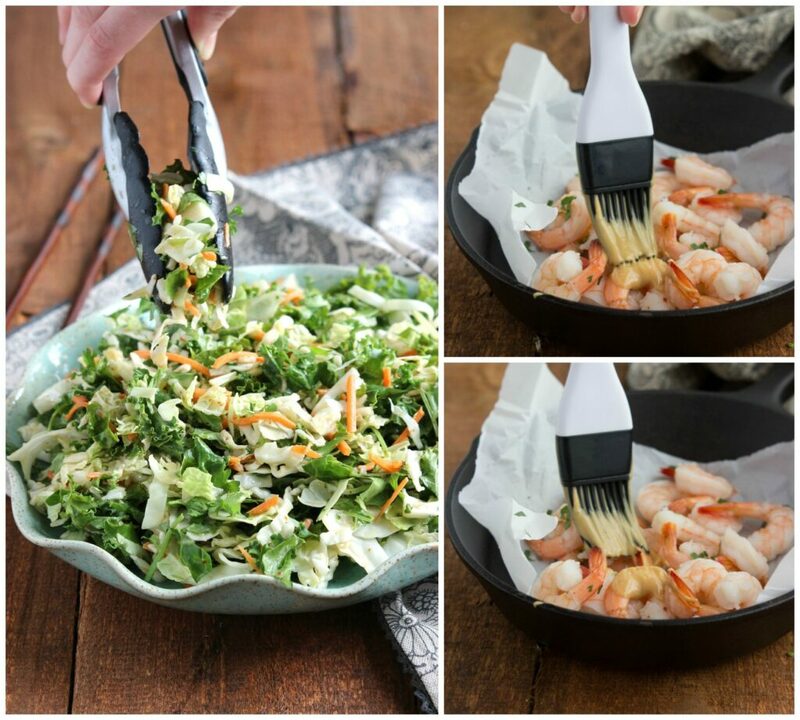 Top each salad plate with a generous handful of wonton strips. If you don't plan on eating this salad right away, hold off on tossing it with the dressing as it makes the lettuce wilt. Toss with dressing right before eating. *Want some heat to the dressing? Add in some crushed red pepper flakes! 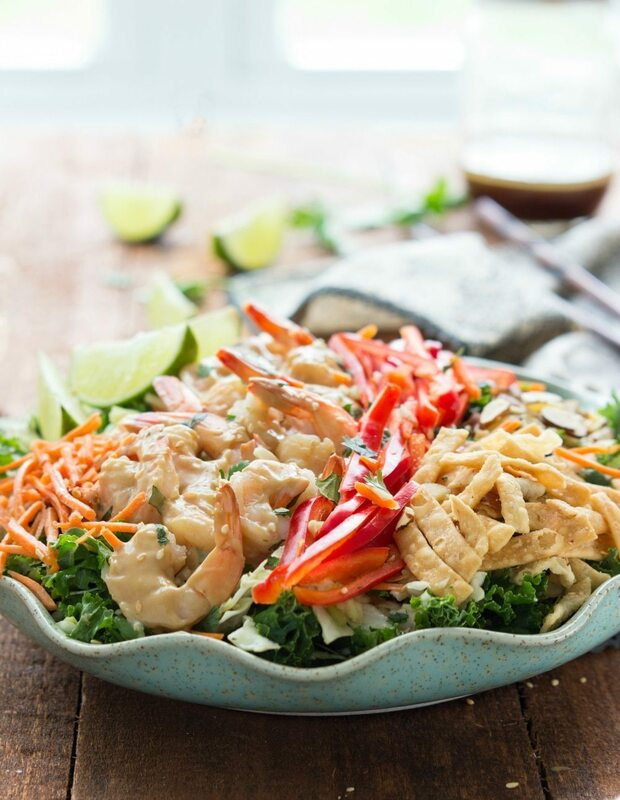 Peanut sauce and shrimp, over salad (<3)? Totally alllll over this girl! Pinned! My husband can’t get enough of red peppers, it’s the kids that have a pile on the side of their plate 🙂 This looks so fresh and delicious- I’d love it with shrimp or chicken. Yum! As soon as I saw the shrimp, I was hooked! This salad looks amazing, Chelsea! Especially with the vinaigrette, perfect for the summer! Pinned! Magnifique recette !!! This salad sounds really good! I love adding different salads to my lunch rotation. 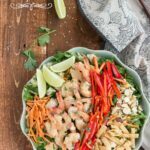 I always have Thai salad with chicken but the shrimp sounds incredible! And the kale just makes it that much better! That looks amazing Chelsea! You sure know how to make a salad look scrumptious! I didn’t know there was anything inspirational on the Applebee’s menu! But this looks wonderful. I love the addition of the peppers!!! Smart to use a kit as a base, it’s shortcuts like those that make dinner a cinch! Great salad girl! Wonderful salad, Chelsea! My stomach started growling while I read this. 🙂 I’m not much of a shrimp fan either! But if you say it was good, then I believe you. 😉 And because obviously it looks good. So it must be! Pinning! This looks like one crazy delicious salad! I love Thai food, Chelsea — this looks amazing! Love everything about this salad! I need to add it to the menu soon! I need to cook more with shrimp. This salad looks fantastic, Chelsea! Pinned! I thought I was in love with the chicken the other day but now you really have me b/c shrimp > chicken in my book! This is an absolutely perfect salad! I haven’t had the original, but I bet yours is even better! You are so sweet Cate! 🙂 Thank you! This salad is utter perfection! All the flavors..just too gorgeous! Aw thanks so much Jess! I hope you love it 🙂 And now I’m going to try your Farmer’s Market Pasta Salad! YUM! Oh gosh, that is one yummy looking (and I’m sure tasting) salad! The peanut sauce on top of the shrimp really caught my attention. I’ve really been needing to add more veggies and salads to my diet and this looks absolutely perfect! Chelsea this salad looks amazing! I’m kind of obsessed with shrimp so this is right up my alley. I love that you added the red bell peppers! Pinning this beautiful salad.